Below are products listed that I have used or am currently using to build my business. If you see anything here you like and would like to check them out for yourself, feel fee to click through my link and take a look at the products. As I said above, all products listed below I have used personally and believe in them. I would not promote them if i didn’t. 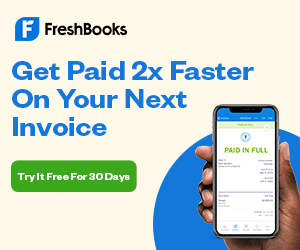 I am using FreshBooks as my cloud accounting software. I love how easy it is to use. I am able to access from my laptop, Ipad or cell phone. I can scan receipts, track expenses and set-up automatic payments for my clients. My favorite feature is that I can track my time and place the time directly into invoices. It’s a great system and is worth the time to check it out. When I decided to become a Virtual Assistant, I came across a course called 30 Days or Less to Virtual Assistant Success. It was written and delivered by Gina Horkey, a millennial momma from Minnesota who had seen major success starting her own Virtual Assistant side hustle while working her fulltime 9-5 and had two small toddlers. The course consists of 13 modules and is jam-packed with great information to help you start your business. She takes you step-by-step and encourages you along the way. I decided to use Siteground as my web host for my website. The customer service has been great. They have taken the time to explain questions I have had and have helped fixed any issues that have come up with my site. Interested in where I got the font used in my logo? I picked this beauty up over at Creative Market. I was able to purchase a font and logo package for only $15.00! I am IN LOVE with this site! There are so many beautiful designs and fonts, I could spend all day on there. When you have some free time you should check it out! Become a Pinterest VA Today holds a special place in my heart. This was the course that helped me to make my decision to become a VA. Kristin is very knowledgeable about Pinterest and has worked with Gina Horkey (developer of 30 DOL) to develop an amazing program. I have learned so much from this program and am glad I made the purchase in an effort to scale my business.